During the off-season, Toronto Maple Leafs' General Manager, Brian Burke, signed two offensively talented players. One of those players being Tim Connolly, who signed a two year $9.5 million contract in July. However, along with Connolly comes a career plagued with injury filled seasons. Over the last five seasons, where Connolly played with the Buffalo Sabres, he was limited to just 239 games out of a possible 410 regular season games. 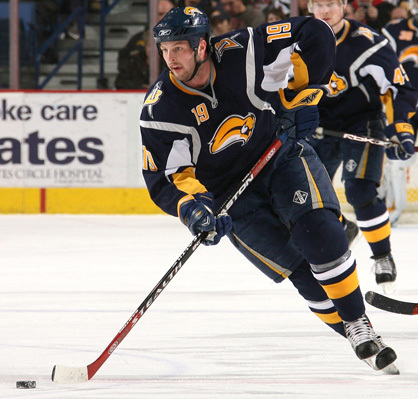 During the '06-'07 season Connolly missed 80 games due to concussion problems, and has missed games since because of reoccurring hip, groin, and back injuries. Moving forward into Toronto, Connolly would like to improve on his last two seasons where he acquired 65 points in 73 games two seasons ago, and 42 points in 68 games last season. Connolly will now find himself on the northern side of the Toronto and Buffalo border battle. In an interview with Lindsay Kramer of NHL.com Connolly said, ""I think in the long run this will be a good move," he said. "I had nothing but great times in Buffalo." Connolly, 30, will more than likely be the Maple Leafs' number one center, and bring a marginal amount of experience to the Maple Leafs' locker room. Where he will be likely the second or third oldest player on the Leafs' roster. If Connolly's play making abilities meshes well with Phil Kessel, Connolly may exceed the 50 point mark for only the third time in his career. However, if Connolly does fall into another injury riddled season the Leafs' should have enough depth to fill in the hole left with his ailment.